Yet business schools are rapidly trying to keep pace with smarts once seen as vital for tech startups, but which are now essential to every industry — the art of A/B testing, rapid product development and data analysis, among others. 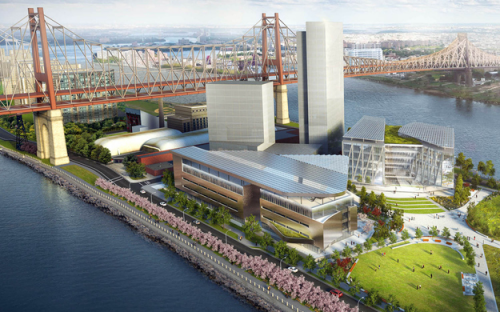 None more so than Cornell Tech, a $2 billion, high-tech business school based in New York City. Cornell Tech brings together business students, tech entrepreneurs, and all manner of cross-disciplinary leaders in a catalytic environment designed to reinvent education for the digital age. Cornell Tech opened to much fanfare in 2012. The school is based in Google’s Chelsea building, but is constructing a campus on Roosevelt Island, with a first phase due to open by September 2017. When fully completed, the campus will include two million square feet of state-of-the-art buildings, over two acres of open space, and will be home to more than 2,000 graduate students and hundreds of faculty and staff. It is this unique physical space, and cross-disciplinary learning that largely does away with case studies, that sets Cornell Tech apart from competitors such as Harvard Business School or Stanford’s Graduate School of Business, according to Doug Stayman, its associate dean. Q. Is a new type of education needed for managing in the digital economy? Cornell Tech was founded because a new kind of education is needed for the digital age. The modern university was built for the Industrial Age. As we have moved from a physical to a software world — from atoms to bits — we need a different kind of school to allow students to flourish. The modern professional schools — engineering, law, and business — have done a fantastic job. But the need for cross-disciplinary interaction and digital-age speed requires a different kind of research and education. Q. How would you describe Cornell Tech? What is the school’s aim for management education? We are developing leaders for the digital age. They need a set of tools that are not easy to deliver within a traditional university setting. At the MBA level, every major program you can name is within a business school. That school is within a separate physical building or set of buildings. That creates a certain culture and limitations. We think it’s critical that business students learn deeply the perspective of people with other skill-sets, who are needed to build digital products. They need to know how to work with them and lead them, and how to do it quickly. At Cornell Tech, you have computer scientists, electrical engineers, and law students all working together within one campus. The Cornell Tech MBA is not within a business school. It’s within a digital infrastructure, and that changes the education. Q. One area always hot for criticism is the case method. Is it still relevant? And what role does it play at Cornell Tech? We think there is a role for cases, but it is limited. Cases help you teach certain business problems in an affective and engaging way. But about 35% of the curriculum on the Cornell Tech MBA is a “studio curriculum” where students build together. Digital products are at the heart of how we bring the students together from different programs. We don’t think the case study method has much relevance there. All the activities at Cornell Tech — such as teamwork, prototyping, and critiquing — don’t lend themselves to case teaching. Q. So it’s all about entrepreneurship? Being entrepreneurial is critical. In the digital age, you have to be entrepreneurial. It’s important to understand how to create a business, even in a large organization, which has to go out and absorb entrepreneurial ventures. Even though many business schools are doing many interesting things — developing an entrepreneurial curriculum or a project-based curriculum — they still have this constraint that they are within a business school. With the Cornell Tech campus, we have this wonderful opportunity to create something new. Q. What do you think is the future of business education — no silos? I always say one of the key outcomes of Cornell Tech is that more and more business schools will start doing what we are doing.